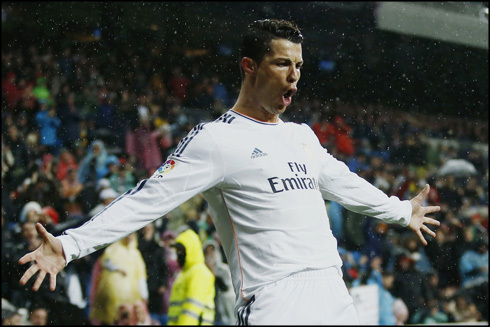 ﻿ Real Madrid 5-0 Rayo Vallecano. And they're back in the title fight! 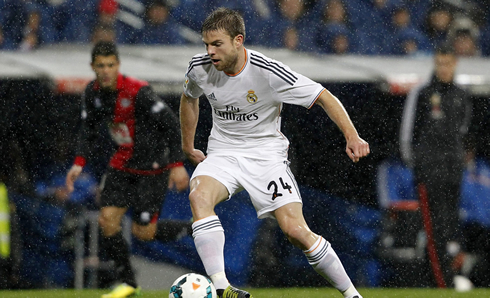 29.03.2014 » Real Madrid 5-0 Rayo Vallecano. And they're back in the title fight! Real Madrid needed desperately to bounce back from their two consecutive losses for La Liga and ended up having in Rayo Vallecano the perfect victim to regain their confidence. The Merengues ran over the visitors by 5-0, with goals coming from Cristiano Ronaldo, Carvajal, two from Gareth Bale and the last one by Alvaro Morata. Everything remains the same on the top of La Liga's table, as all the top contenders in Spain managed to win their games earlier this Saturday. Real Madrid hosted and crushed Rayo Vallecano in a 5-0 win, while Barça pulled off a crutial 0-1 victory in the Barcelona derby against Espanyol, and Atletico Madrid showed their heart and determination, after coming back from a 1-goal deficit to still win the match against Athletic Bilbao, at the new San Mamés stadium. Cristiano Ronaldo led the Whites to the comfortable home win after scoring the opener around the first quarter of an hour and was followed by Carvajal, Bale (2x) and Alvaro Morata in the score sheet. Next Wednesday, Real Madrid takes on Borussia Dortmund for the Champions League first leg, but before that, there's still plenty of action taking place across Europe, with an exciting Liverpool vs Tottenham clash for the Premier League, that will probably be decisive for the Reds' title hopes. The game will be hosted at Anfield Road right this Sunday afternoon. The two straight losses against Barcelona and Sevilla have basically put the Merengues in a very delicate situation and where they were left without any marging for error whatsoever. Moreover, Real Madrid stepped onto the pitch in the Bernabéu already knowing that both Barça and Atletico Madrid had won their respective league fixtures, which whether we want it or not, somehow had to increase the pressure on Ancelotti's men. The Italian manager made a few changes to his team, bringing in Fábio Coentrão to take place Marcelo's left-back spot, Sergio Ramos for Varane, and Angel Di María for Luka Modric. The Croatia international didn't train this past Friday and was spared from this Saturday's Spanish football encounter, since Ancelotti most likely had in mind that next Wednesday Real Madrid is already meeting Borussia Dortmund, for the first leg of the Champions League quarter-finals. 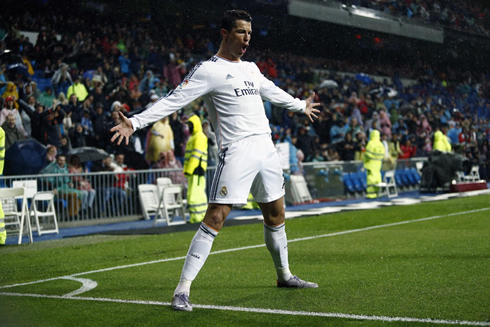 However, the second goal would only arrive after the half-time and it would come from a very unlikely goalscorer. Real Madrid's right-back Daniel Carvajal, made his scoring debut for the Spanish club, after finishing off a great team play on which Cristiano Ronaldo made the final assist for the Spaniard to score from an easy close range strike. Despite his very offensive playing style, this has only been Carvajal's second career goal since he left Real Madrid Castilla's team, at the end of the 2011-12 campaign. His first goal was scored in the Bundesliga last season, during the time he was playing for Bayer Leverkusen. The third goal started being fabricated close to the left-wing, with a beautiful triangulation between Karim Benzema, Cristiano Ronaldo and Angel Di María. The Argentine winger managed to get plenty of yards in front to run at his that usual frenetic pace that he so much loves to go into, and after stepping inside Rayo Vallecano's box, it didn't take him long to spot Gareth Bale on the far post and delivering him the assist for an easy tap-in goal. The Welshman had finally found the back of the net, which now happens following 6-game drought that began right after that 1-6 away win against Schalke 04, at the end of last month. Judging from what we've got to see just two minutes later, it seems that the former Tottenham star wasn't quite ready to settle with only 1 goal in this game. 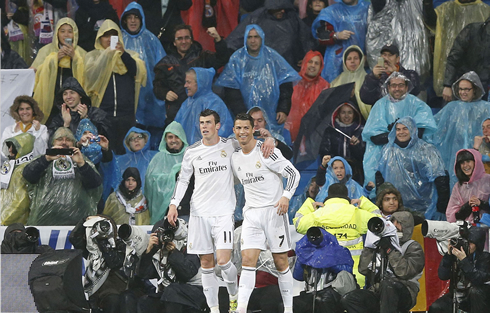 The match was on its 70th minute when a lightning Bale decided to show up in the Bernabéu. The Wales international picked up the ball way behind the midfield line and then initiated a solo-run from almost one box to another. During his incredible counter-attack race, he left two defenders behind and still managed to keep his composure when he only had Rayo's goalkeeper in front. He didn't miss such a good opportunity and easily made the 4-0 to Real Madrid. 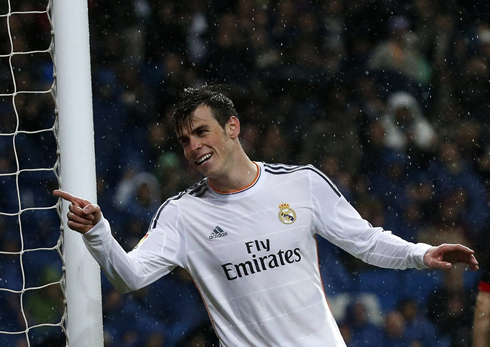 That was Bale's 12th La Liga goal, his 16th in all competitions this season. 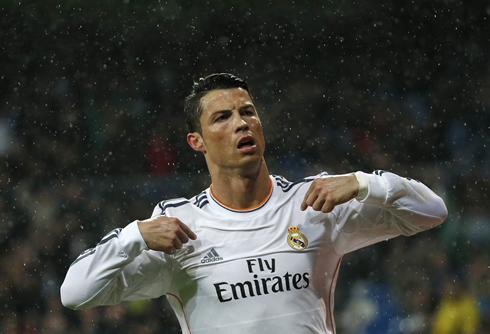 With tonight's opener, Cristiano Ronaldo has reached his 44th goal of the season, his 28th in the Spanish League. On this rainy day, CR7 has also set a new personal record of 10 straight games always scoring (9 for Real Madrid and 1 for the Portugal National Team). Cristiano Ronaldo next game for Real Madrid will be against Borussia Dortmund for the UEFA Champions League quarter-finals first leg, on the 2nd of April of 2014. You can watch Juventus live stream, Real Madrid vs Borussia Dortmund, Barcelona vs Atletico Madrid, Manchester United vs Bayern Munich, and Liverpool vs Tottenham, all matches provided from our soccer streams pages.